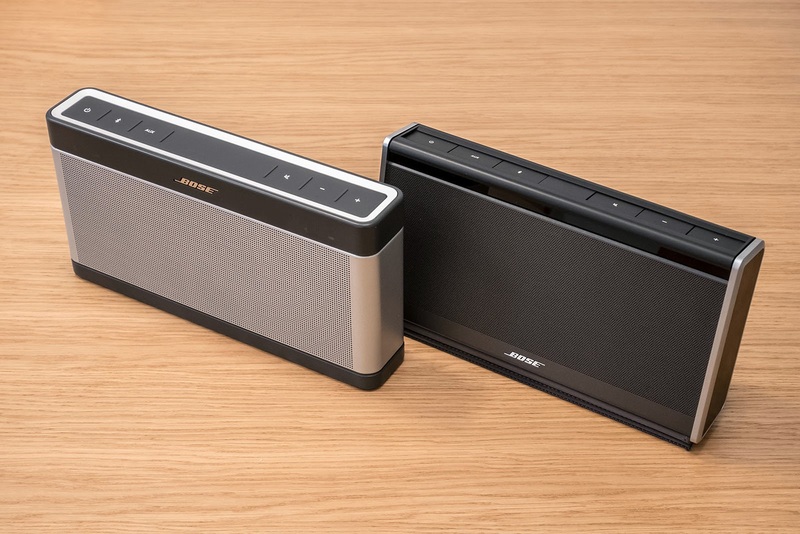 Bose announced the new Soundlink III speaker! The third generation comes 1.5 years after the Soundlink II and 2.5 years after the original one, which was announced in September 2011. The new Soundlink has a slightly different design and comes naked without any cover now, but there are optional covers with various colors available, for those who actually need one. I am not sure if I liked the old design better than the new, especially the limited white edition was really an eye catcher. The new one reminds me a bit of a squashed B&O Beolit 12 just missing the leathered handle. At least the buttons are rubber covered now, similar to the ones from the Soundlink Mini. I must confess that with the Soundlink II I sometimes encountered unwanted resonance vibrations from the buttons that were rattling at particular frequencies, due to being a bit loose. This probably won't happen with the new one anymore. I am not sure if much changed on the hardware side apart from cosmetic adjustments. There is still no Apt-X support, no built in handsfree or USB-charging, the functionality remains exactly the same as before. Also the acoustic core consisting of 2 transducers per channel including 2 opposing passive radiators seem to be the same, so maybe the sound tweaks come only from different DSP-processing. But at least the new one is claimed to have an improved battery life of 30% which should make it play up to 14 hours. 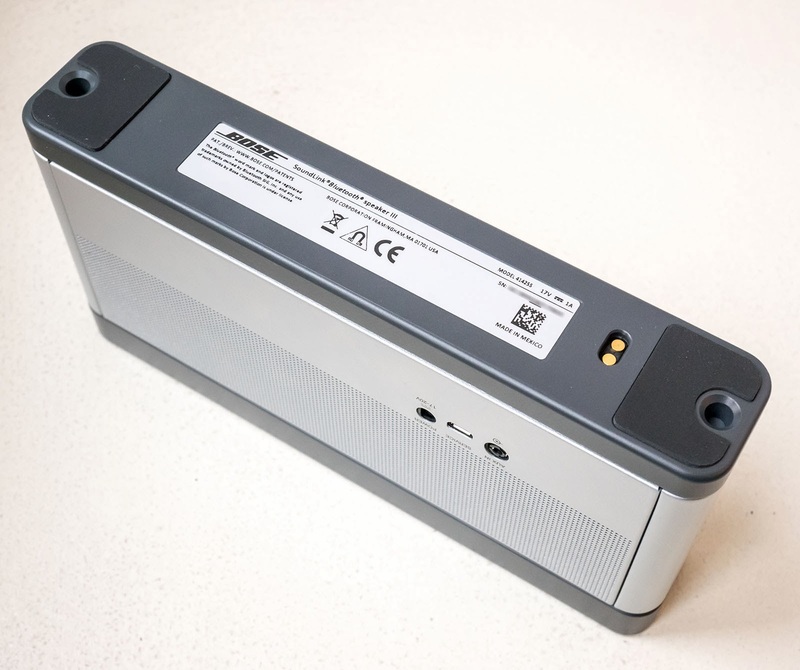 The battery doesn't seem to be directly accessible by the user anymore, but according to Bose it is still easily replaceable by pulling out the rubber feet, which I didn't try though. I also found some new contacts at the bottom which would maybe suggest an option for a future charging cradle similar to that of the Soundlink Mini. Thanks to Bose I already got a demo unit of the new one as well as the previous version. As my neighbour still owns the first version, I will be able to compare all three generations. First impression so far: The new one sounds definitely better than the previous one. The sound is less veiled, broader and more open with more brilliance in treble and seems less directional too, not suffering that much in treble response when not listened directly on-axis. Bass seems a little better controlled, not that artificial sounding as on the Soundlink II, at the same time the Soundlink III doesn't sound as stressed at top volume with less obvious dynamic compression and it sounds less boomy at low levels, which is pretty welcome if you want some low background music, which was hardly achievable with the old one, as that one sounded extremly dull when not applying some special "tricks". Top volume is more or less the same, the new one sounds a bit fuller at top volume with more upper bass and therefore can make the impression of being a bit louder, but don't expect any loudness miracles. The very first Soundlink still remains one of the loudest and most powerful portable speakers, but at a slightly larger size of course. 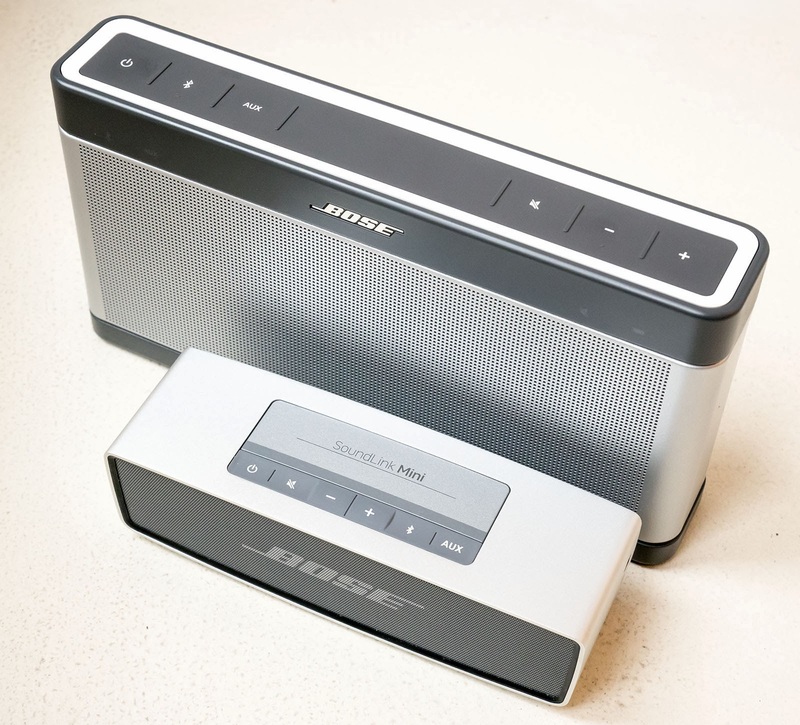 Soundwise the Soundlink III seems to more resemble the Soundlink Mini now, although the differences are not huge between all of them to tell the truth, you are still hearing the same Bose sound signature, so don't expect JBL or Loewe sound now. So far I have the impression that this is the best sounding Soundlink yet! I am planning to prepare an extensive comparison video and review soon, so stay tuned! Update: full review can already be found here, enjoy! Ich hatte nie vor mit dem Blog ganz aufzuhören, ich wollte nur wegen Zeitmangels etwas kürzer treten. Es ist seit damals zwar nicht wirklich besser geworden, aber ich geb mein bestes. Die Aufnahmen heute haben über 2 Stunden gedauert, aber dafür gibt's es dann einen Vergleich von allen 3 Soundlink Generationen inkl Soundlink Mini bei halber und maximaler Lautstärke. Ich hatte auch noch vor eine Aufnahme von schräg oben vorzubereiten damit man hört wie der Klang sich ändert wenn man nicht genau axial hört, hab's aber nicht mehr geschafft leider. 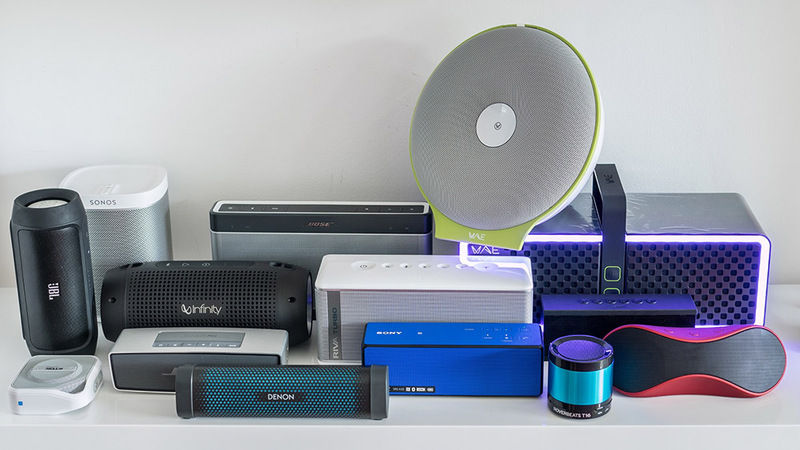 Dafür wird es zusätzlich auch noch einen Vergleich mit der UE Boom geben. Jetzt brauche ich nur noch ein paar weitere Stunden Zeit um die Videos zu schneiden... Uff! Thanks for your review ! Very helpful ! I bought the SLIII a few weeks ago. I don't understand the useful of the charging cradle wich is available on sale. I mean, i can plug my loader in order to charge the battery and in the same time listen to music. I read reviews pretending that it was impossible listenning to music during the charging of the device. Does it depends on the version of the speaker ? Maybe the "new" one allows this kind of practice ? Hope you understand my request. Sorry for my english, i'm a French guy living in Reunion Island.